What do you write about when there's nothing to write about? When the weather is so diabolical (rain, thunder, lightning) that you can't even do the weekly litter-pick and there's no point in continuing with the "Clearing Out the Garage" project because everything will get wet. Especially me. I've finished my book (don't forget to read my review on The Book Page) and I've updated my Family Tree page (ditto above.) I've been to aqua-aerobics, continuing my quest to master the fine art of acrobatics in the water. Maybe one year it will be an Olympic sport. If this happens, I shall immediately put myself forward for selection. 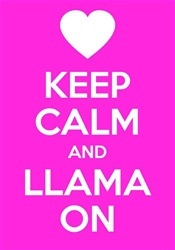 What I need to do, as my Middle Grand-daughter would doubtless tell me, is to "Keep Calm and Llama On." No, don't ask me because I won't know the answer. All I know is that the Middle Grand-daughter and her buddies are obsessed with the aforesaid woolly animals. So much so that when she went for an audition recently for a pantomime part, and was asked to sing Old Macdonald's Farm, imitating a farm animal, she chose to imitate a llama. Bet you didn't know that Old Macdonald had a llama on his farm, did you? No, nor did I. I asked the llama-lover exactly what sound the furry ones make and she made a kind of spitting noise at me. And, oh yes, she made the grade for the pantomime, presumably on the basis of original thinking. In the interests of further research (and for want of anything better to do) I visited the website of the British Llama Society which (and I quote) "brings together a lively community of people all of whom have been captivated by these fascinating animals." Llamas, the website informs me, have an exotic quality, are intelligent, and what's more have "a gentle temperament and an inquisitIve nature." So like a llama you are, my lovely girl!